France Launches Multi-Lingual Tourist Website. It Goes Down And Stays Down. Far be it from me to criticize the French. But yesterday France launched France.fr with a middling amount of press attention. But the site went down almost immediately after launching. This morning we gave it a pass, but tonight it’s still down. And we’re not sure anyone is working very hard to get it back up – it is just an information website, after all. A NEW official website providing information about France in English has been launched by the French government. The site aims to promote the country to tourists but also to provide residents with practical information about all elements of life in France – including studying, working, setting up a business and day-to-day living. The prime minister’s office, which is managing the new online project, said the site would grow in the coming months and it will contain some 12,000 links to other online resources including Météo France and tourist offices. And France’s senior government official overseeing the Internet, Nathalie Kosciusko-Morizet, even took the time to tweet “Lancement aujourd’hui du portail officiel de la France dans le monde” (“Today’s launch of official website of France in the world”). A French friend says of the site (when it was live) “It just does not work, full of bugs, and the english translation is hilariously bad.” He won’t let me attribute his quote though, saying he’d like to remain in good standing with the French community. 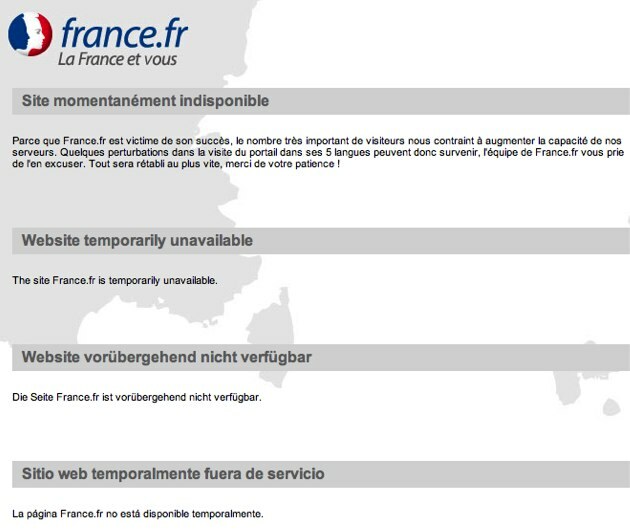 For now France.fr has a landing page saying the site is unavailable in a variety of languages. In French it goes into more detail, noting that the site is a victim of its own success.